New York: Random House, 1962. First edition, first issue with correct titles on rear jacket panel, and price of 295/295 on front flap. Quarto, original pictorial white paper boards, pictorial endpapers, illustrated throughout. Fine in a near fine dust jacket. A very nice example. 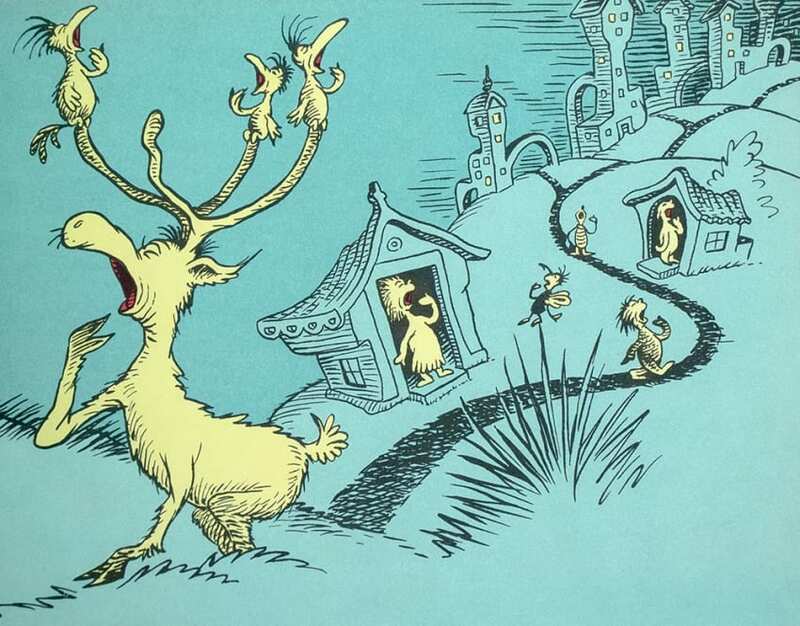 Written to be "read in bed," the story begins with one small yawn that spreads from bedroom to bedroom across the country until finally ninety-nine zillion, nine trillion and three Seussian creatures are sound asleep. 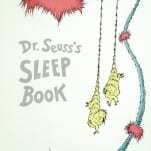 “Critics welcomed another opportunity to hail an author who made Americans smile, and even more children began falling asleep to Dr. Seuss” (Morgan, 178). Younger & Hirsch 20. 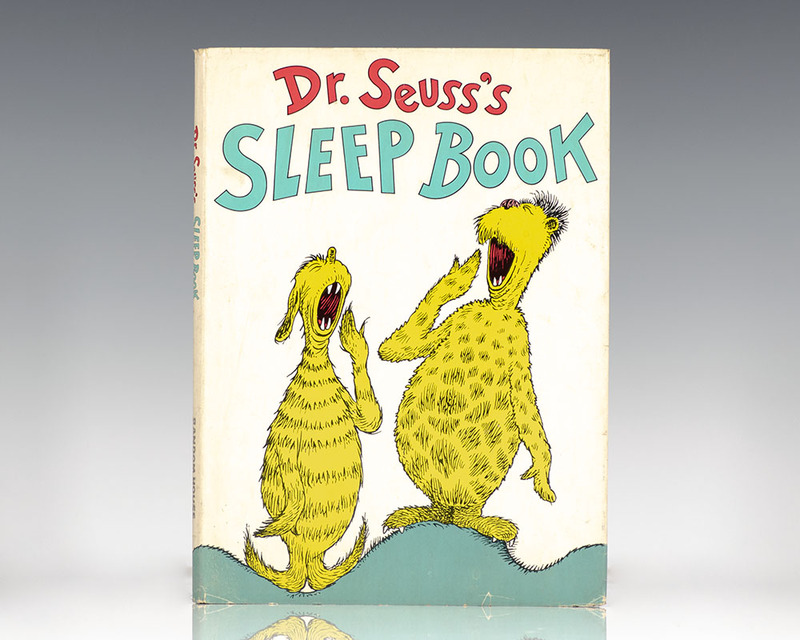 First edition with the 250/250 price on the front flap as well as the $2.50 price added to the rear flap (state ‘c’) of the first Dr. Seuss title to feature full-color art on every other page. Quarto, original cloth, pictorial endpapers, illustrated throughout. Inscribed by the author, “For Mrs. Haye with very kindest regards- Dr. Seuss.” Near fine in a near fine dust jacket with light rubbing and wear. Uncommon signed and inscribed. 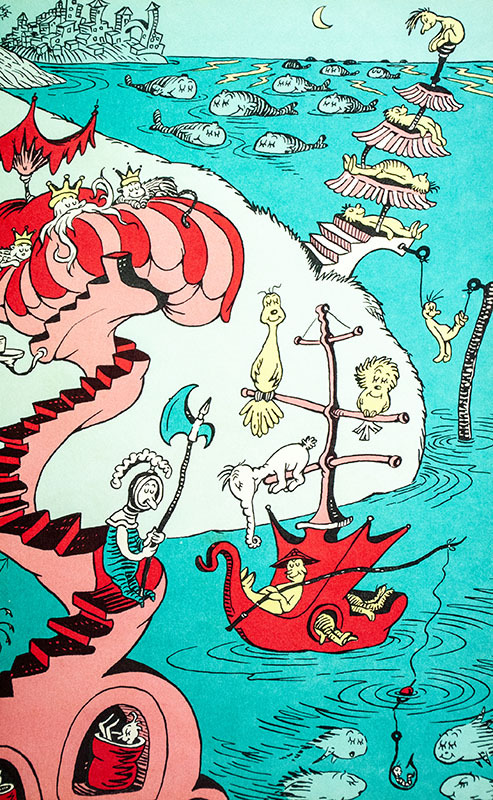 First edition of this book of tongue twisters by Dr. Seuss. Octavo, original laminated boards, pictorial endpapers, illustrated throughout. Signed by Dr. Seuss opposite the title page. In fine condition. 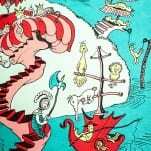 Seuss, Dr. [Theodor Seuss Geisel]. 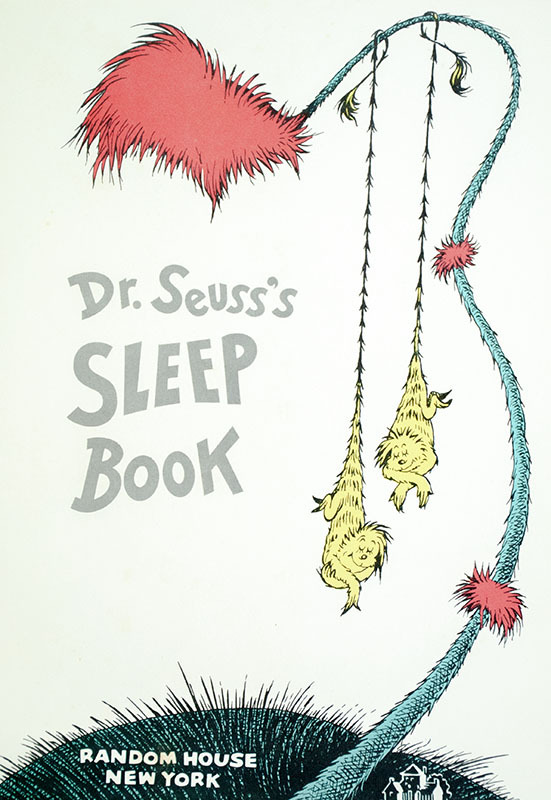 First edition, first issue of Dr. Seuss’ classic work. Octavo, original illustrated unlaminated boards. Presentation copy, inscribed by the author opposite the title page, “For Sigler Best Wishes from Dr. Seuss” with a large drawing of the cat in the hat in black and red ink. The recipient was a neighbor of Dr. Seuss. 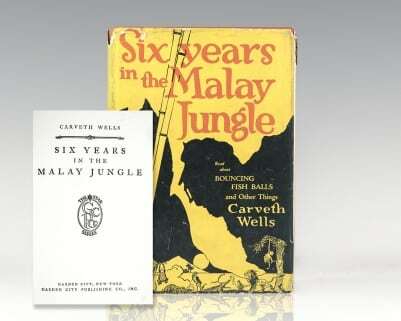 An excellent example in a near fine dust jacket with light rubbing. All issue points present: price of 200/200 on the dust jacket, no mention of the “Beginner Books” series on the rear panel, and has four paragraphs of educator’s reviews on rear panel. Book contains a single signature and 61 pages with a message on final page before end paper contained in an outline of the cat’s hat & head. 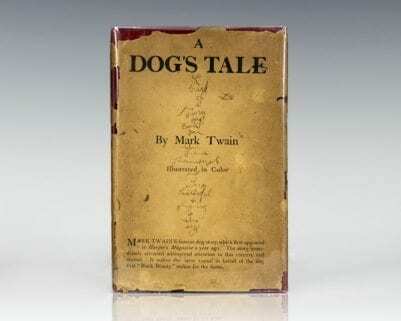 We have never seen a true first edition with an original drawing. Housed in a custom half morocco clamshell box. Rare and desirable. New York: Random House, 1987. 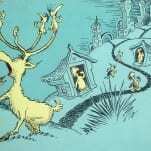 First edition of the re-issue of this classic Dr. Seuss title. Inscribed by the author, “For Jennifer with best wishes Dr. Seuss.” Fine in a near fine price-clipped dust jacket. First edition of this classic rhyming bedtime story picture book. Quarto, original pictorial boards, illustrated endpapers, illustrated throughout. Boldly signed by Dr. Seuss opposite the title page. Fine in a near fine price-clipped dust jacket (with no ads for later titles). Younger & Hirsch, 20. Rare and desirable signed. First edition of the sequel of Dr. Seuss’ The Cat in the Hat. Octavo, original illustrated boards, pictorial endpapers. Inscribed by Dr. Seuss opposite the title page. Very good in a very good dust jacket with some light rubbing. 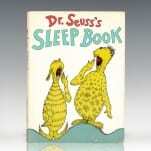 First edition, first issue of Dr. Seuss’ classic work. Octavo, original illustrated unlaminated boards. Inscribed by the author, “For Ruth Dr. Seuss.” Fine in an excellent dust jacket with light wear. All issue points present: price of 200/200 on the dust jacket, no mention of the “Beginner Books” series on the rear panel, and has four paragraphs of educator’s reviews on rear panel. Book contains a single signature and 61 pages with a message on final page before end paper contained in an outline of the cat’s hat & head. Housed in a custom half morocco clamshell box. A very nice example.